Apple’s iPhone release schedule has been predictable in the past when it comes to number of devices: each year, a single new smartphone. For 2013, that’s changed with the iPhone 5c, as for the first time Apple has eschewed simply bumping down the outgoing iPhone as a lower cost option, and has instead released hardware specifically designed to be more affordable. The iPhone 5c is the result of this rare change in Apple’s game plan, and it makes a good argument for being flexible with product lines. 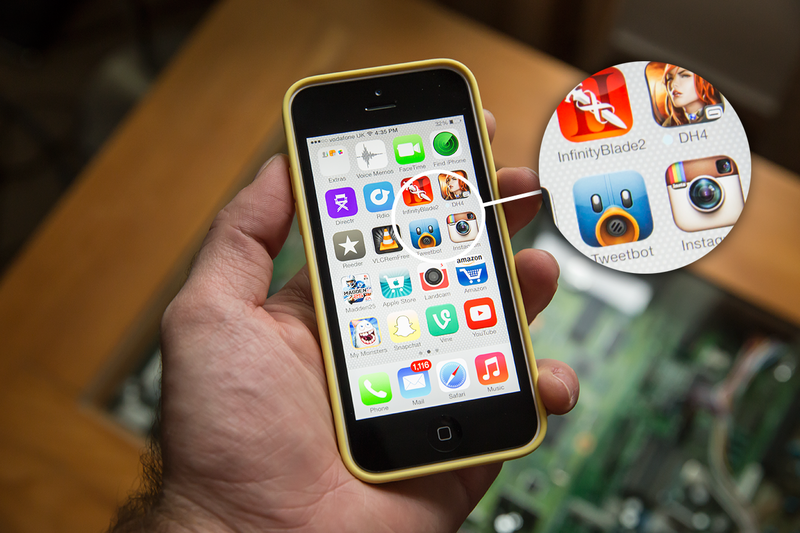 Arguably the iPhone 5c’s most noteworthy feature is its new design. Apple went plastic, or should I say went back to plastic, after switching to metal and glass with the iPhone 4. To date, Apple’s choice of materials has been one of its prime differentiating factors, at least from an aesthetics point of view, vs. the Android crop of competitors. So does dipping back into a polycarbonate shell threaten the image Apple has tried so hard to cultivate? The answer is a resounding ‘No.’ Apple notes that the iPhone 5c is actually polycarbonate because it wanted to get the colors just right, and doing so in metal just wasn’t feasible. Further, it points out that there’s a steel frame (which doubles as an antenna) girding that polycarbonate shell, which results in a phone that feels sturdy in the hand, without the flex or perceived fragility of other plastic device designs. In fact the iPhone 5c is slightly heavier than the iPhone 5s, weighing in at 132g vs. 112g for the all-metal flagship iPhone. The added weight gives it a nice heft; it’s just a shade lighter than the iPhone 4S, which lends it a feeling of substance. The material of the case, while glossy and smooth, doesn’t feel prone to slipping from your grip, and the rounded edges and corners are also a very nice fit for the contours of your hand. Some interesting details I noticed about the iPhone 5c vs. the 5 and 5s: its lock/power button appears to be the same as the volume buttons, which could help Apple save on manufacturing costs, and there’s a simple, four-hole single speaker grill on the bottom, whereas the metal designs have two grills, each with two rows of holes. It doesn’t seem to make much different to speaker performance, however. If you’re familiar with Apple’s iPhone Retina displays, than the screen on the 5c needs no introduction. If the 5c is your first iPhone, or your first Retina-capable iPhone, than the screen will truly impress. Other manufacturers have exceeded Apple’s PPI count with screens of their own, but the 4-inch Retina shows no signs of age despite now being year-old technology. Apple’s iPhone display makes text ultra crisp and clear, but it also offers the best and most consistent color and tone balance of any mobile screen in my experience. And the Retina screen gains additional new life thanks to iOS 7, the mobile OS overhaul that Apple is launching alongside the iPhone 5c and 5s. Both ship with iOS 7, and one of its key improvements is that has a new, lightweight system font that shows off the Retina’s text rendering prowess extremely well. We’re treating iOS 7 to its own separate review, but it’s worth highlighting some of the software features that really pop on the iPhone 5c. First, Apple has decided to ship each iPhone 5c with a color-matched lock and homescreen wallpaper pre-installed and activated on every new device, which has a small but significant effect on consumer experience. It gives the 5c a subtle, ‘your own phone, right out of the box’ type of feel, which is ideal for a device that seems to be aimed at a very broad group of users who might not be instantly comfortable or familiar with customization options. 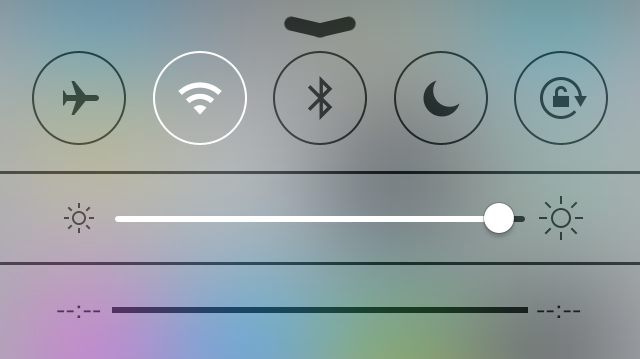 Another big improvement for all iPhones with the iOS 7 update is the new Control Center feature, which provides quick access to Wi-Fi, Bluetooth, Do Not Disturb and other toggles, as well as apps including the Calculator, flashlight activation and AirPlay/AirDrop controls. It’s a much smarter, much easier to get at version of the app tray Apple previously used to provide access to some of these features, including music playback controls. The app tray was one of the least understood features of iOS among users in my experience, co Control Center, combined with the new multitasking windows accessible via double-tapping the Home button, should go a long way to helping new users get accustomed to Apple’s mobile software. 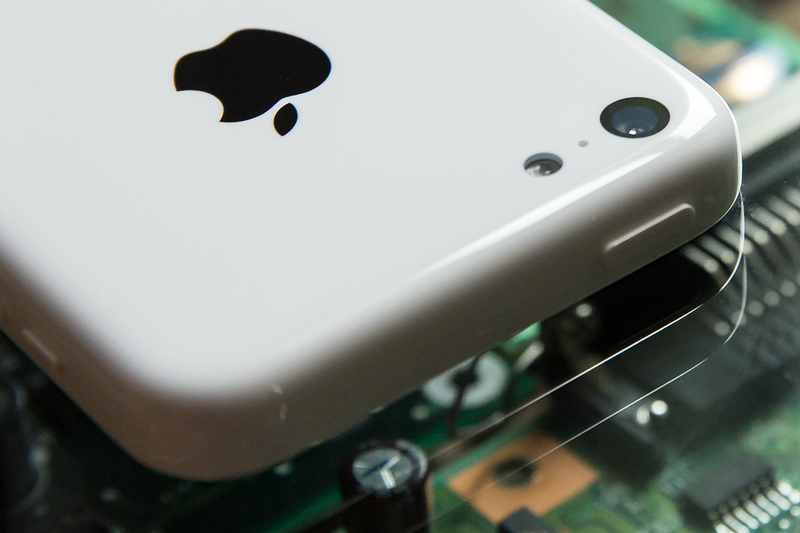 The iPhone 5c inherits the capable camera of its predecessor, the iPhone 5s. That 8 megapixel shooter remains one of the best smartphone cameras in terms of practical use, if not on paper, that’s currently available on a mobile device. That means it’s packing a backside illumination sensor, a f/2.4 aperture and a hybrid IR filter. But software is where the 5c gets some serious camera improvements. The camera app in iOS 7 offers features like built-in filters, which can be applied during or after photo capture, and there’s improved face detection, which can now capture up to 10 individual faces even during 1080p video recording, as well as 3x zoom during video shooting and improved video stabilization. As you can see from the video demo segment, the HD video quality is very nice (the vertical pan is somewhat shaky though, as is to be expected shooting freehand). New in the iPhone 5c is the FaceTime camera, which improves over the iPhone 5’s front-facing shooter with larger individual pixels and better backside illumination, all of which adds up to better low-light capture. The effect is immediate when you’re using FaceTime or other video chat services, since colors are better-rendered and there’s less grain on the image. Apple is focusing on exactly the right areas with the FaceTime camera, since low-light is the most common use case with the front camera when video chatting indoors or capturing party selfies. Frontbacks should come out much better with an iPhone 5c. As you might expect, the iPhone 5c performs a lot like the iPhone 5, which is to say it’s lag-free, fast and responsive. You won’t want for processor power with current generation games and apps, and at least for now, the difference between 32-bit and 64-bit apps (which are new with the iPhone 5s and its A7 system-on-a-chip) won’t be felt by any consumers. That said, it’s conceivable that as devs start to build experiences designed for 64-bit mobile computing, the 5c could feel the pinch with some edge case software, probably of the advanced creative variety. The iPhone 5c performs a lot like the iPhone 5, which is to say it’s lag-free, fast and responsive. One big area where Apple has improved the iPhone 5c is with the range of its wireless connectivity options. Both the iPhone 5c and 5s can support up to 13 LTE bands, which makes them much more likely to support LTE on multiple networks. Right now, carriers don’t have very many LTE roaming agreements in place, so when travelling internationally you’ll probably still get bumped down to 3G, but as those agreements fall into place that’ll change, with more global LTE coverage available on both devices. As a special treat, if you’re purchasing an unlocked device, it should be LTE compatible with other networks out of the box. For instance, I purchased an EE 4G LTE data-only SIM for the UK in my U.S.-model iPhone 5c review unit, and it instantly connected to the EE LTE network. This is great news for both travellers and people who’d like more options for reselling their device or moving country-to-country down the road. Here’s something I think many of you will be happy to hear: In my experience, the iPhone 5c got better battery life than the iPhone 5 during general usage. On average, I got around a day and a half of standby, with between 6 and 15 hours of actual usage depending on my activity mix (more HD video streaming towards the lower end). On my brand new iPhone 5 hardware, I’d been getting less than that under similar conditions. Apple is advertising slight gains to battery performance with the iPhone 5c vs. the iPhone 5, but in terms of lived experience the 5c definitely seems like a step up, and the improvements to the standby power management algorithm in iOS 7 really seem to be cutting back on idle power draw. Apple’s iPhone 5c sparked a lot of debate prior to its launch, prompting observes to wonder what it might mean for Apple to build a “cheap” iPhone or target a new market segment. What Apple has delivered is far from a “cheap” device, in terms of both quality of experience and hardware, and in terms of price. The 5c is probably more broadly appealing than the iPhone 5s just by virtue of its lower cost of entry, but it’s still premium hardware and is likely better thought of as an analogue to the iPhone 4S relative to the iPhone 5 back when that device launched. the 5c also has a focus on color, personality and a sort of ‘lightness’ of design. But the 5c also has a focus on color, personality and a sort of ‘lightness’ of design. The phone feels ‘young’ overall, and it’s likely that’s the kind of consumer that’s going to enjoy this device; the youth market and those just getting their first smartphone or moving up from their first budget Android device to the big leagues. The iPhone 5c is an improvement, even if slight, to the smartphone I’d still call the best available if Apple hadn’t also released the iPhone 5s. I’ll say that with the caveat that I believe the iPhone is still the best smartphone available for the largest number of smartphone buyers, in terms of both usability and design, even with the dramatic changes wrought by iOS 7. Given the choice, I’d choose an iPhone 5c over an iPhone 5, based on design alone, and ignoring its other benefits. In other words, if you’re in the market for a new smartphone, Apple’s iPhone 5c should be right near the top of your list.